Over the years, you may have seen me in the company of spectacularly dressed gentlemen, with white plumage above their chapeaus, silken capes of various colors trailing behind them and a glistening sword at their side. These men make up the Color Corps of the Knights of Columbus and they assist me at various special Masses and Confirmations. However, they are only one, very visible part of the Knights of Columbus. In fact, the Knights are all around us, in nearly every parish in the Diocese. This fraternal order of our Catholic Church focuses its energy through its long-held principles of Charity, Unity, Fraternity and Patriotism. Since 1882, when founded by Venerable Father Michael McGivney in New Haven, Connecticut, the Knights have remained committed to their motto, “In Service to One. In Service to All.” From the very beginning, the focus of the Knights of Columbus was to help others. When founded in the 19th century, society had very few protections, especially in a place like the industrialized North, where injured factory laborers were not only out of a job when they got hurt, or worse killed, but there was little to support the families of these men. Father McGivney formed the Knights of Columbus to offer financial assistance to families in need. However, since that time the Knights of Columbus have expanded far beyond what Father McGivney could have predicted. With more than 2 million Knights across the globe, in 2017 they performed 75.6 million hours of service worldwide, which works out to be nearly $1.9 billion of donated service time. In addition to their physical service, Knights are not afraid to organize and promote charitable fund-raising. In 2017 they raised almost $186 million for a variety of charities. While these numbers are impressive, for most Knights, their desire is to simply help their neighbors and their Church. Whether it is providing coats for kids in the winter; food drives throughout the year; assisting the homeless; spearheading Right to Life initiatives; supporting our schools and parishes or, simply helping to foster community among Catholics with pancake breakfasts and pasta dinners, these Catholic gentlemen are living examples of Christ’s message. I hope all Catholic men will consider joining the Knights of Columbus. There are too few places in today’s secularized world where a man can feel embraced for living his Catholic faith publicly and proudly. In February, I completed my journey to full Knighthood when I was invested into the Fourth Degree, the Patriotic degree. 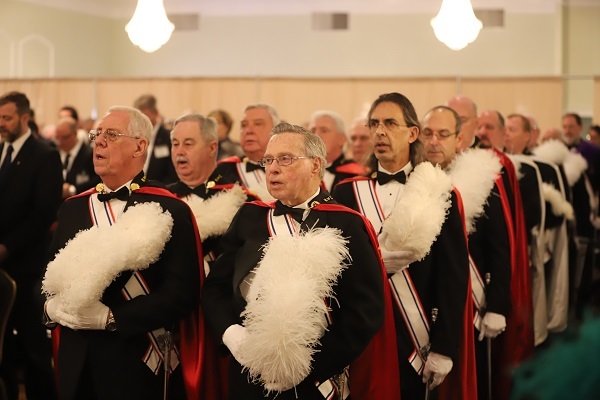 It was a beautiful and heartening ceremony, as all Knights of Columbus ceremonies are. I can say that I am proud to hold the title of Sir Knight. Prouder still that 93 Catholic gentlemen stood with me that day to become Fourth Degree Knights. If you are a Catholic man in good standing, or perhaps you have a son, father, husband or friend that is, I invite you to take the time to learn more about the Knights of Columbus. Further information is available on-line at www.kofc.org/joinus or, speak directly with a Knight in your parish. I know of no finer Catholic men’s organization, than the Knights of Columbus.